Why did I often find it hard to cope with the Church? I promised to write about myself, so as to fill a gap some of you have found in How to Cope with the Church. I said I would tell something of my own journey. Here are some of my earliest memories of that journey. What did I first find hard to cope with? Firstly, I have never really been religious. I have never liked ceremony, dressing up or any of the obvious physical aspects of religion. My parents were not atheists, but were not regular churchgoers either. We went at Christmas, Easter (sometimes) and to weddings. The language of the King James’s Bible and the 1662 Prayer Book were as offputting as the hardness of the pews. In addition, I found kneeling uncomfortable, distracting me from whatever was being said. I was not sorry that my parents valued our time together, often going into the countryside. Therefore, they didn’t make me go to Sunday School (whatever that was). What was easier to cope with? When I went to Bristol University, I was amazed to find that quite a lot of people went to Church voluntarily, even getting up on Sunday mornings. Some students ran lots of Christian activities through the week. There were Bible studies and prayer-and-fellowship meetings. On Saturday nights, they held sessions of singing relatively modern hymns, followed by teaching from visiting preachers. It was all more relevant, interactive and understandable than Church as I had known it. Did this help me cope with Church? Yes. I gradually got around to going to Church too. By then I understood what it was all about more than I had done, but I still struggled. At least, I was accompanying some Christian friends. There were also quite a few other people of my age in some of the churches we went to. Some churches were experimenting with updated versions of the Prayer Book and the Bible. There were meetings after the evening service, where we could discuss the sermon or some other topic. When did I almost fail to cope? The years immediately following university were difficult. I moved to another town where I didn’t know anyone. After a search, I found a church with some young people, where services were in fairly modern English. It was, however, led by older men and was very conservative in outlook in many ways. They did not encourage us to question anything much. On top of all that, in hindsight, I think I was suffering from culture shock as I came from the student World to the nine-to-five. I was dealing with people who were far more set in their ways than those I had been living among for the previous three years. After about three more years, just as I was beginning to cope, big upheavals were to come to my life, including my church life. I will write about those, and how I coped, in another blog or two. Perhaps this series will help you get more out of my book, How to Cope with the Church. 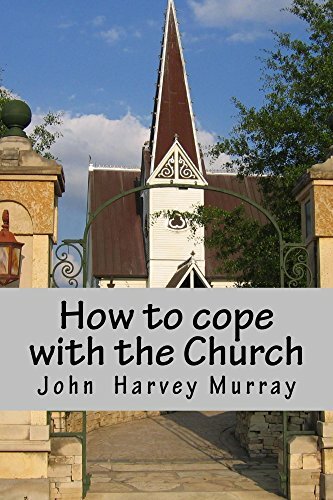 Author John MurrayPosted on August 27, 2018 Categories UncategorizedLeave a comment on Why did I often find it hard to cope with the Church? What do people say is missing from my writing? Myself! Who wants to know about myself? You might have thought I didn’t need to write about myself, if you’re interested in what I have to say rather than who I am. However, there are people who like to know all about the writers they follow. There is quite a lot on my website and on my business website as well as on my Linkedin page. I am as I seem. Why do I not say more about myself? Like many of you, I expect, I think people who talk about themselves a lot are boring and probably egoists. To use a cliche, “It’s not about me”. I’m more interested in what people have to say about whatever topic they are writing or talking about, than in what they do at work or at home. What do I not say about myself? The one thing some people would like is an account of my journey in life, especially my spiritual or religious journey. They wish I had included it in How to Cope with the Church. Now prepare to read about myself – or not! Over the next few weeks, I will be writing about my spiritual journey. I hope this will add clarity and credibility to my blogs on faith, as well as to the book. For those of you for whom that subject holds little interest, I will still be blogging about risk, business, statistics and such, on my other site and I might publish the occasional article on this site on other subjects, to give some variety (for me as well as for you). Author John MurrayPosted on August 5, 2018 Categories UncategorizedLeave a comment on What do people say is missing from my writing? Myself!